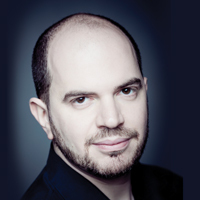 The multifaceted pianist Kirill Gerstein has rapidly ascended into classical music’s highest ranks. With a masterful technique, discerning intelligence, and a musical curiosity that has led him to explore repertoire spanning centuries and styles, he has proven to be one of today’s most intriguing and versatile musicians. His early training and experience in jazz has contributed an important element to his interpretive style, inspiring an energetic and expressive musical personality that distinguishes his playing. Mr. Gerstein is the sixth recipient of the prestigious Gilmore Artist Award, presented every four years to an exceptional pianist who, regardless of age or nationality, possesses broad and profound musicianship and charisma and who desires and can sustain a career as a major international concert artist. Since receiving the award in 2010, Mr. Gerstein has shared his prize through the commissioning of boundary-crossing works by Timo Andrews, Chick Corea, Alexander Goehr, Oliver Knussen, and Brad Mehldau, with additional commissions scheduled for future seasons. Mr. Gerstein was awarded First Prize at the 2001 Arthur Rubinstein Piano Competition in Tel Aviv, received a 2002 Gilmore Young Artist Award, and a 2010 Avery Fisher Career Grant. A significant highlight of Mr. Gerstein’s 2016-17 season is the New York premiere of a new Urtext edition of Tchaikovsky’s Piano Concerto No. 1 in the composer’s own 1879 version of the score with the New York Philharmonic led by Semyon Bychkov. He will also perform this version of the concerto with the Atlanta Symphony, Detroit Symphony, Grant Park Orchestra (in its U.S. premiere), and Naples Philharmonic. Mr. Gerstein’s ECHO Klassik Award-winning world premiere recording of this version of this work paired with Prokofiev’s Piano Concerto No. 2 with the Deutsches Symphonie-Orchester Berlin led by James Gaffigan was released by Myrios Classics in 2015 and marked Mr. Gerstein’s first orchestral recording. Internationally, this version of the score was performed with the BBC Scottish Symphony Orchestra at the BBC Proms in London, as well as with the St. Petersburg Philharmonic and the Gewandhaus Orchestra. Additionally this season, Mr. Gerstein performs Busoni’s epic Piano Concerto with the Boston Symphony Orchestra led by Sakari Oramo (and returns in the 2018-19 season to play the world premiere of a BSO-commissioned piano concerto by the orchestra’s first-ever artistic partner, Thomas Adès), Gershwin’s Rhapsody in Blue in the original jazz band version and Schoenberg’s Piano Concerto with the Cleveland Orchestra led by James Gaffigan and both Gershwin’s Piano Concerto in F and Rhapsody in Blue with the St. Louis Symphony conducted by David Robertson to be recorded for future release. He also returns to the New Jersey, San Diego, and Vancouver symphonies, performs recitals at the Kennedy Center and with the Chicago and Seattle symphony orchestras, and joins the Hagen Quartet for chamber music concerts at Zankel Hall in New York and at Duke University. In Europe, Mr. Gerstein performs Tchaikovsky’s Piano Concertos Nos. 2 and 3 as part of Semyon Bychkov’s Tchaikovsky Festival with the BBE Symphony Orchestra and plays with the Brno Philharmonic, Deutsches Symphonie Orchester Berlin, Göttinger Symphonie Orchester, Hamburger Symphoniker, Helsinki Philharmonic, and Luzerner Sinfonieorchester. Recent engagements have includes performances with the Los Angeles and New York philharmonics, Philadelphia and Minnesota orchestras, and the Atlanta, Baltimore, Boston, Chicago, Cincinnati, Dallas Detroit, Houston, Indianapolis, Montreal, St. Louis, San Francisco, and Toronto symphonies, among others. He has appeared at Tanglewood with the Boston Symphony, Aspen Music Festival, Santa Fe Chamber Music Festival, Chicago’s Grant Park, Blossom Music Festival with the Cleveland Orchestra, and with the Philadelphia Orchestra at the Bravo! Vail Valley Festival, Mann Music Center, and Saratoga. Internationally, he has played with such prominent European orchestras as the Berlin, Czech, Munich, Rotterdam and London philharmonics, the City of Birmingham Symphony Orchestra, Dresden Staatskappelle, Finnish Radio Orchestra, Royal Concertgebouw, Tonkünstler Orchestra Vienna, WDR Symphony, Orchestra Cologne, Zurich Tonhalle, and the NHK Symphony Orchestra in Tokyo. He has performed recitals in Paris, Prague, Hamburg, London’s Wigmore Hall and Queen Elizabeth Hall, and the Liszt Academy in Budapest. He made his Salzburg Festival debut playing solo and two piano works with András Schiff and has also appeared at the Lucerne and Jerusalem chamber music festivals and the Proms in London. Mr. Gerstein performs Liszt’s Transcendental Études on a new recording released by Myrios Classics. His other solo recordings for the label include Imaginary Pictures comprising Mussorgsky’s Pictures at an Exhibition, Schumann’s Carnaval, and a recording of works by Schumann, Liszt, and Oliver Knussen. Both albums were chosen by The New York Times as a best recording of 2010. He also collaborated with Tabea Zimmerman on two recordings of sonatas for viola and piano. Born in 1979 in Voronezh in southwestern Russia, Mr. Gerstein studied piano at a special music school for gifted children and, while studying classical music, taught himself to play jazz by listening to his parents’ extensive record collection. After coming to the attention of vibraphonist Gary Burton, who was performing at a music festival in the Soviet Union, Mr. Gerstein came to the U.S. at 14 to study jazz piano as the youngest student ever to attend Boston’s Berklee College of Music. After completing his studies in three years and following his second summer at the Boston University program at Tanglewood, Mr. Gerstein turned his focus back to classical music and moved to New York to attend the Manhattan School of Music, where he studied with Solomon Mikowsky and both bachelor’s and master’s of music degrees by the age of 20. He continued his studies in Madrid with Dmitri Bashkirov and in Budapest with Ferenc Rados. An American citizen since 2003, Mr. Gerstein now divides his time between the U.S. and Germany.